Stubborn fat deposits and excess skin on the abdomen can be difficult to correct through diet and exercise. A flabby abdomen may be preventing you from having the firm, attractive contours that you desire. An unattractive stomach area can be the result of pregnancy, weight loss, genetics, or the natural aging process. Tummy tuck surgery eliminates excess skin and fat to restore a slimmer, more toned abdomen. Thinking About Getting a Tummy Tuck? Tummy tuck surgery often involves liposuction or excision to remove excess fat that is resistant to diet and exercise. It can treat fat accumulations on the upper and lower abdomen as well as fat on the hips. For many people, fat removal helps them reach their weight-loss goals and feel more comfortable in their bodies. Some people, especially women after pregnancy, experience stretched abdominal muscles that cannot be restored with exercise. Tummy tuck surgery can suture the abdominal muscles back together to tighten and tone them. This helps correct a stomach pooch and restores a firmer abdominal contour. Tummy tuck surgery trims away excess skin to slim the appearance of your abdomen. A slimmer waistline allows for clothing to fit better and for a wider variety of clothing options. 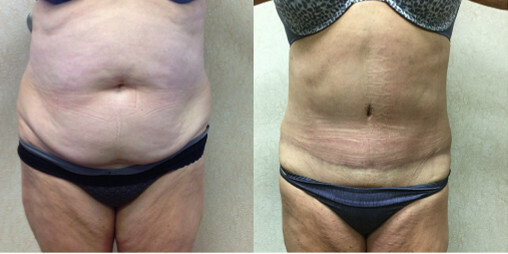 Eliminating excess skin can also improve definition in the abdomen. For patients who have achieved significant weight loss, a slimmer waistline can also eliminate the discomfort caused by sagging, chafing skin. While tummy tuck surgery helps you achieve many cosmetic improvements, the most important is the improvement in your confidence. When you don’t feel happy and comfortable with your body, it’s hard to feel confident about yourself. Gaining a body that enhances your appearance often helps enhance your confidence as well. Increased confidence often has a positive impact on many other aspects of your life. Dr. Wald will evaluate your body type to help determine what type of tummy tuck will help you achieve your desired results. The amount of skin and fat present and where it has accumulated can all affect which technique will be used. Dr. Wald will devise a plan that is tailored to your needs after your consultation. You've just had a Tummy Tuck! Now what? Following tummy tuck surgery, the abdomen will be covered by a compression garment to help reduce swelling and improve abdominal shape. You may experience some bruising, swelling, and redness. Prescribed medication will help alleviate any pain or discomfort. You will be required to limit to physical activities. Don’t bend over or lift heavy objects. You will still need to wear your compression garment to facilitate the healing process. Patients can return to work and begin engaging in light physical activity. You should begin to notice an improvement in your abdominal swelling. Most major swelling will have subsided, and your final results will become apparent. We're eager to inform you of all your tummy tuck options and are available to answer any questions you may have. Schedule your consultation today and start your journey toward achieving the abdomen and confidence you desire!